But PVC has a history that is often lost as older generations retire and with them, the knowledge & historical information leaves. I want to thank Herb Hammer, who retired from GLT Products after 40 years, for providing me with this historical background on PVC fitting covers. Let’s go back some decades to the days before anyone ever dreamed of PVC fitting covers; let’s say 1960. As a general rule, when all of the pipe insulation had been applied, the insulator would have to go back and cover it with a protective layer. The Insulator would mix up a bag of insulating cement (referred to as “mud”) and apply enough to the insulation so that the thickness of the cement was equal to that of the pipe insulation. The cement fitting would then be wrapped in a lightweight canvas (most often a 4 oz/sq yard Osnaburg). Finally, another thin coating of cement was applied. In those days, and decades prior, the insulator had to be a sculptor of sorts. This process was the standard practice for all fabricated pipe insulation fittings, let’s say 4” in diameter or smaller. For larger sized fittings (elbows, tees, and the like) the insulator would use a saw to miter the insulation for the fitting and match the pipe covering. They would then use mud and canvas to finish the job. There were several variations of this common system, but this one was the most widely used. In the early 1970's along came a young man working for a major insulation company who invented PVC fitting covers. By using thin PVC and a heated press, he created molds that accommodated every sized fitting. 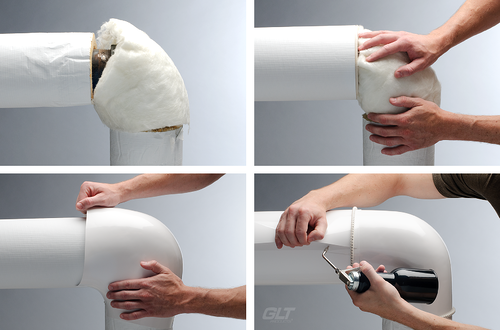 The objective was to wrap the joint with a diaper shaped, lightweight fiberglass insulation, then cover it with the glossy white PVC fitting cover. After first, this idea was not widely accepted. Contractors thought it wouldn’t work, and unions rejected the idea, claiming that the system would take work away from their members. Thankfully, that didn’t stop the fitting makers, and the idea began to grow. Contractors began using them on the job, specifiers found it to be a great idea, and unions came to realize that the system would make life easier for their members. Plus, there was a significant saving in labor costs as a result of this new method. Today, PVC fitting covers are being used not only in the U.S. but worldwide. 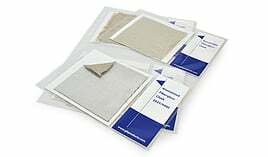 They speed up the job, are more aesthetically pleasing, and have become one of the primary methods for covering pipe insulation in interior spaces. PVC Fitting Covers are proof that it does take time for change to be accepted, but once it is, there is no turning back.